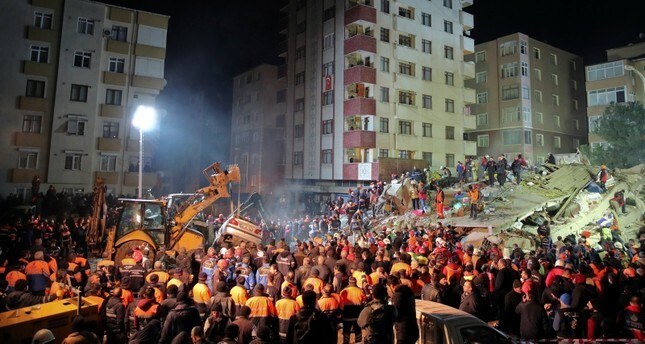 At least three people died after an eight-story apartment building in the Kartal district on Istanbul's Asian side collapsed on Wednesday. Istanbul Gov. Ali Yerlikaya told reporters early Thursday that rescue teams working overnight pulled 12 people out of the rubble with injuries. Three of them were in serious condition, Yerlikaya said. It was not immediately clear how many people were still trapped in the debris of the building on the Asian side of Istanbul in the mostly residential Kartal district. An image from Google maps shows the apartment building prior to its collapse. "It was built in 1992 as a five-story building but three more stories were added later illegally," he said.